Buteless There is 1 product. 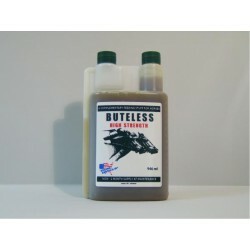 Buteless is manufacturer in the USA by "Equine America"
Buteless High Strength is a natural and palatable formulation containing high quality botanical extracts that can be fed alone or used in combination with Cortaflex for long-term concerns or for additional support for the older horse. New Buteless High Strength can now be fed effectively at only 15ml a day, representing excellent value for money.